Domestic Sluttery: What have we been reading recently? What books have we been carrying around in our handbags? Which authors have been getting us talking? Here's what we've been reading recently. Sian: I recently found myself in possession of an eReader (after Frances and I went to a Kobo event and ate all of the canapes). I was skeptical, but I love it. 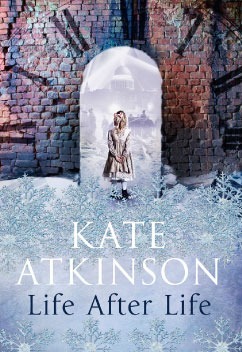 After sterling recommendations from Sara and Kat, my very first ebook purchase was Life After Life. It's a fabulous book, tragic and gripping without becoming sentimental. I'd wanted to read Mr Penumbra's 24-Hour Bookstore for a while and although it started off brilliantly, it really dragged in the middle. Now I'm lost in The Night Circus (a year after everyone else) and it's absolutely dreamy. I haven't totally turned my back on books! I recently nabbed a first edition of The Poisonwood Bible - my favourite book . And call me biased, but I devoured The Rough Guide to Vintage London the second it landed on my desk. It's full of actual insider information and great big fabulous chunks of it were written by our very own Frances Ambler. Kat: Having quite enjoyed the 100 Year-Old-Man Who Climbed out of the Window and Disappeared last month, I took the Kindle store's recommendation and went for The Unlikely Pilgrimage of Harold Fry. It was ok, but felt weirdly empty in the middle which some lovely writing couldn't solve. Much more excitingly, I rediscovered a childhood favourite: L.M. Montgomery's Emily of New Moon trilogy. Emily, a dedicated writer with an other-worldly nature, is a far more engaging heroine than Anne of Green Gables, and Montgomery clearly finds her much more interesting to write. The whole thing is 77p on Amazon, so do yourself a favour and plug yourself in. Laura B: I started the month reading Facebook COO Sheryl Sandberg's book, Lean In. It explores gender inequality in the workplace, and encourages women to be assertive when it comes to their career ambitions. Although criticised for being written with über-women like Sandberg in mind, I found it relevant to my life. Next up was Guardian columnist Hadley Freeman's new book, Be Awesome, which is a brilliantly funny and wise book of essays, filled with '80s and '90s pop culture references and feminist awesomeness. I'm currently dipping in and out of Cucina Povera by Pamela Sheldon Johns, a wonderful collection of Tuscan peasant recipes (cookbooks make excellent bedtime reading), and I'm about to start rereading The Secret History by Donna Tartt, because it's one of my favourites, and I can't wait until her new book is published in October! Frances: I spent this month catching up on books people have been eagerly thrusting under my nose for years, starting with The Immortal Life of Henrietta Lacks. Cell research? Normally straight over my head but this story skilfully balances the story of Henrietta - whose cells became the most commonly used cells in research the world over - with larger political and ethical issues, and in a way even the most unscientifically minded can follow. If you like Brain Pickings, you’ll probably adore Anne Lamott's Bird by Bird. Lamott is a funny and generous guide and the book is full of wonderfully worded thoughts I want to commit to heart. My only new release this month was Leanne Shapton's Was She Pretty? a collection of illustrations and neat one liners, inspired by the strange feelings we have towards ex-partners and the exes of exes. It feels voyeuristic, a bit painful and was utterly impossible to put down. My current book is a slightly gentler poke at relationships: Barbara Pym's Excellent Woman. Written in 1950s, it’s got vicars, anthropologists and jumble sales and I can’t wait to find out how it all unfolds. Hazel: Once again it's all cook books for me! Pasta - Mastering the Basics has been in my kitchen all week, it covers pasta making and drying then moves onto recipes that are all simple and really appealing, the rigatoni with sausage and parmesean was the most comforting thing I've eaten in ages. I also found The Pleasures of Cooking with Wine by Emily Chase which was first published in 1960 and could have been written just for me. It has a whole section on booze salads, yes BOOZE SALADS! Marvellous stuff! Laura H: I've been on a crime-spree this month... that is reading about it, not committing it. I'm starting with the classics, and so far have covered Edgar Allen Poe's 'The Murders in the Rue Morgue' and Thomas De Quincy's On Murder. Poe is at his best with his insouciant, oddball genius crime solver C. Auguste Dupin - a precursor to Mr Holmes - the grizzly murders always drawing to a surprising conclusion. De Quincy is deliciously dark, reveling in and dissecting a series of notorious murders committed in 1811 in an alarmingly funny way. I've also been wallowing in the delightful ambiance of our featured book of the week, The Ethicurean Cookbook. Produced by the team of four friends who run the same-titled restaurant just outside of Bristol, the book is a thing of beauty; finely bound and beautifully produced inside and out - much like their food. What have you been reading recently? What should we read next? I really didn't enjoy Harold Fry either. But I cried at the end, which given how bored I was made me feel a bit emotionally manipulated. A brilliant suggestion of books as ever, and am rushing back to my over-thumbed L.M. Montgomery books as I type! And thanks for the lovely words about the Vintage Rough Guide, Sian, I'm blushing. I really do love it. Housemates have nicked it. You should totally read The Other Typist by Suzanne Rindell, it's full of 1920s New York goodness and makes me want to drink gin and champagne cocktails and cut my hair into a bob. It's a great read with plenty of twists which will keep you guessing even after it ends. That sounds so good! Sadly not available on my eReader, otherwise I'd be reading it right now. I'm going to have to pick it up soon. I can't imagine anyone not liking Life After Life, it's such a wonderful book. I did spend the first 100 pages thinking 'wait, what the hell is going on?' - if you've read Time Traveller's Wife, it's a little bit like that. Stick with it, I don't know when or how it all starts becoming clear, but it does!